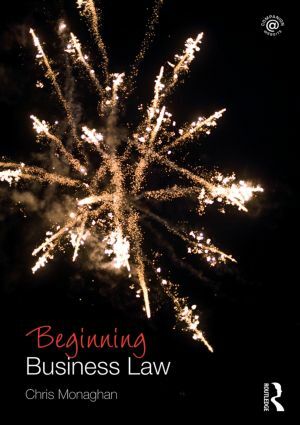 Whether you’re new to higher education, coming to legal study for the first time or just wondering what Business Law is all about, Beginning Business Law is the ideal introduction to help you hit the ground running. Starting with the basics and an overview of each topic, it will help you come to terms with the structure, themes and issues of the subject so that you can begin your Business Law module with confidence. Adopting a clear and simple approach with legal vocabulary explained in a detailed glossary, Chris Monaghan breaks the subject of Business Law down using practical everyday examples to make it understandable for anyone, whatever their background. Diagrams and flowcharts simplify complex issues, important cases are identified and explained and on-the- spot questions help you recognise potential issues or debates within the law so that you can contribute in classes with confidence. Beginning Business Law is an ideal first introduction to the subject for LLB, GDL or ILEX and especially international students, those enrolled on distance learning courses or on other degree programmes. Chris Monaghan is Senior Lecturer in Law at the University of Greenwich. The new Beginning the Law series from Routledge is a collection of pure introductions which help students come to terms with the basic structure, themes and issues of each discipline before they advance with confidence to their core textbook. Adopting a clear and simple approach with legal vocabulary explained in a detailed glossary, each subject is broken down using practical everyday examples to make it understandable for anyone, whatever their background. Diagrams and flowcharts simplify complex issues, important cases are identified and explained and on-the- spot questions help you recognise potential issues or debates within the law so that you can contribute in classes with confidence. apply the ‘big picture’ to narrow areas of the law.